The veteran author of such high-spirited realistic romances as The Bad Lands (1978), among others, moves in on Caleb Carr’s territory with this colorful historical picaresque. Hall’s agreeable hero (and narrator) is 20ish Tom Redmond, an “apprentice journalist” working (in the early 1800s) for a San Francisco “satirical weekly” (The Hornet) who’s the wary protÇgÇ of celebrated writer and misanthrope Ambrose Bierce. 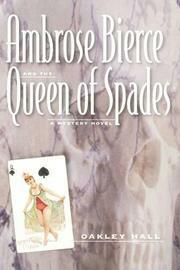 Tom’s education moves into overdrive when Bierce’s interest is piqued by a series of vicious murders of women, whose bodies are left decorated by playing cards (all spades). The cub reporter’s tentative research leads to the discovery of a complex stock fraud that points—despite Bierce’s antimonopolistic suspicions (he believes the Southern Pacific Railroad guilty of everything)—to a mysterious cooperative: “the Society of Spades in Virginia City [Nevada], which was convened in order to purchase the Jack of Spades Mine.” But that’s only the beginning, in a beautifully paced thriller that also involves senatorial duplicity, a high-profile divorce, a bizarre case of concealed parentage that must have Wilkie Collins spinning in his grave with envy, and such deliciously devious supporting characters as procuress (and reported black magician) Mammy Pleasant, suspicious Chief of Detectives Isaiah Pusey, and “Highgrade Carrie” Stearns, “the Miners’ Angel” (in more than one sense). Tom weathers all the storms more than manfully—even if it seems he’ll never win the plucky Amelia Brittain. And Hall has the admirable good sense to surrender generous swatches of the narrative to “Bitter Bierce,” who declares himself “the sworn enemy of piffle,” not to mention Southern Pacific, organized religion, “femininnies,— and mogul —úeland $tanford,— among numerous others. And how can you dislike a curmudgeon capable of such invective as “This murderer’s adiposity is casting a shadow on my eggs that I fear will turn them rancid—? Superlative entertainment. Has Oakley Hall really been this good all along, and if so why isn’t his fiction better known?